On most cruise ships, alcoholic drinks, specialty coffees, meals in alternative restaurants (and associated gratuities), spa treatments, Internet, purchases in the onboard shops, certain menu items like surf 'n' turf or a la carte snacks like pastries and sushi, shore excursions, some fitness classes, limited-access sun decks, baby-sitting services, arcade games, and some shows and entertainment experiences carry an additional cost. On some European lines' ships, there might also be an additional charge for water at non-mealtimes. 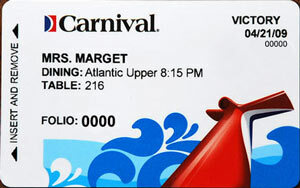 As a reminder, meals in the main dining room and buffet, water and juice from buffet or pool-area dispensers, most room service (some lines charge during certain hours or for hot items), select fitness classes and use of the gym, kids and teens facilities, some onboard classes, use of the casino, the pool, most entertainment and your room are included in the price you pay for your cruise. Select cruise lines -- mostly luxury -- are more inclusive; your cruise fare might even cover excursions, specialty meals, specialty drinks and more. Several additional-cost elements of your cruise experience can be paid for before you get on the ship. Crew gratuities can be paid up front, rather than tacked on to your account at the end of the cruise, as can beverage and specialty dining packages. Laundry packages also can be pre-purchased if you anticipate needing extensive laundry services for the duration of your cruise. Special extras, such as sparkling wine, flowers, canapes or cabin decorations, can also be arranged prior to your sailing, so they'll be waiting for you (or someone special) when you arrive. Can I pay for anything (including tips) in cash? None of the onboard shops, restaurants, bars, spas or other facilities on your ship will accept cash, but it isn't uncommon to leave a few dollars for a room steward, your waiter or another crewmember who you feel has demonstrated exemplary service. Typically, this is done at the end of your cruise. For more about onboard tipping, see our tipping article. Can I set a spending limit? Yes. The best way to do that is to put a set amount of cash into your onboard account at the beginning of your cruise. When it runs out, it runs out. This is especially helpful with kids and teens who might get swipe-happy at the arcade, candy store or onboard shops. You will receive a paper statement at the end of your cruise (usually the last night) alerting you to the balance that will be charged to your account. 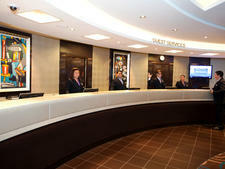 You can also check in throughout the cruise by visiting an automated onboard kiosk or visiting the reception desk and speaking with passenger services. Likewise, if you have an issue with a charge, that's the place to settle it. It's much wiser to dispute or discuss a charge while you're still onboard; don't wait until you're headed home to decide you didn't buy that second beer. Yes, on most large cruise ships, you'll find ATMs, but they carry heavy surcharges to use. On smaller ships or riverboats, don't expect to find many (if any) machines. 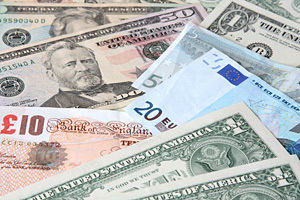 What currency is used onboard if I'm sailing overseas? 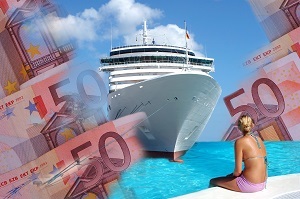 Onboard currency depends on the cruise line with which you're sailing. If it's an American cruise line, the onboard currency will be the dollar; if you're sailing a European line, expect the onboard currency to be the euro. It's always best to check with your line before boarding. Can I pre-purchase onboard credit or spending money? Yes. Whether you're buying onboard credit as a gift or for personal use, it's available for purchase before your cruise or once onboard. Find out how to earn onboard credit for free before springing for it yourself. Are there truly all-inclusive cruises? That depends on what you consider all-inclusive. Certain luxury and river cruise lines include things you would typically have to pay for on a mainstream line, such as beer or wine with meals, top-shelf cocktails, shore tours, specialty dining venues, Internet, concierge and butler service, and more. Hebridean Island Cruises, a British line, will even pick up your tab if you drink in port. How can I learn more about onboard expenses?